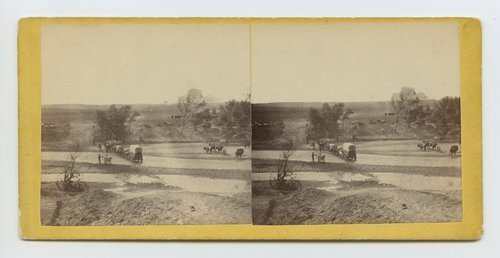 This stereograph shows a bull train and cattle crossing the Smoky Hill River at Ellsworth, Kansas. Visible in the photograph is a covered wagon. It is from Alexander Gardner's series, Across the Continent on the Union Pacific Railway, Eastern Division. Bull train crossing the Smoky Hill River at Ellsworth, Kansas. On the old Santa Fe crossing 508 miles west of St. Louis, Mo.